Natarajan Chandrasekaran (born 02 June 1963) is an Indian businessman who is the chairman of Tata Sons. He was COO and executive director of Tata Consultancy Services (TCS), where, in 2009, he became CEO. He is also Chairman of Tata Motors and Tata Global Beverages (TGB), and is the first non Parsi executive to head the Tata Group. Chandrasekaran studied in a Tamil Government school in Mohanur. He later received a bachelor's degree in Applied Sciences from the Coimbatore Institute of Technology in Tamil Nadu. He earned his Master of Computer Applications (MCA) from the Regional Engineering College, Tiruchirappalli (now National Institute of Technology, Tiruchirappalli), in Tamil Nadu, India, in 1986. 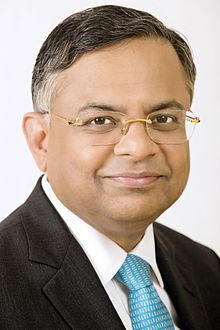 Joining TCS in 1987, Chandrasekaran took over as CEO on 6 October 2009, prior to which he was COO and executive director of TCS. Chandrasekaran is a senior member of Institute of Electrical and Electronic Engineers (IEEE), and an active member of Computer Society of India and British Computer Society. He was nominated as the chairman of Indian IT industry body NASSCOM in April 2012. Chandrasekaran has spent his career in TCS, joining the company in 1987 after completing masters in computer applications from Regional Engineering College, Trichy, (now National Institute of Technology, Tiruchirappalli) in Tamil Nadu. Under his leadership TCS has generated consolidated revenues of US$16.5 billion in 2015-16. With over 353,000 consultants, TCS has become the largest private sector employer in India. TCS remains the most valuable company in India ended 2015-16 with a market capitalization of over US$70 billion. Under Chandrasekaran's leadership, TCS was rated as the world's most powerful brand in IT Services in 2015 and was recognized as a Global Top Employer by the Top Employers Institute across 24 countries. On 25 October 2016 Chandrasekaran, CEO and managing director of Tata Consultancy Services (TCS), was appointed as additional director on the Tata Sons Board. Chandrasekaran was born in a Tamil family in Mohanur near Namakkal in Tamil Nadu. He resides in Mumbai, with his wife Lalitha. Chandrasekaran is an avid photographer, music aficionado and a passionate long-distance runner who has completed marathons in Amsterdam, Boston, Chicago, Berlin, Mumbai, New York and Tokyo. He completed his fastest marathon or personal record (PR) at TCS New York City Marathon (2014) with a finishing time of 5 hr 00 min 52 sec. Chandrasekaran has received several awards and recognition in the business community. India's central bank, the Reserve Bank of India appointed him as director on its board in 2016. He has served as the Chairperson of the IT Industry Governors’ at the WEF, Davos in 2015-16. Aside from being a member of Indo–US CEO Forum, he is also part of India's business taskforces for Australia, Brazil, Canada, China, Japan and Malaysia. He served as the chairman of NASSCOM, the apex trade body for IT services firms in India in 2012-13 and continues to be a member of its governing Executive Council. He was voted as the ‘Best CEO’ for the fifth consecutive year by the Institutional Investor's 2015 Annual All-Asia Executive Team rankings. During 2014, he was voted as one of CNBC TV 18 - ‘Indian Business Icons'. He was also awarded CNN- IBN Indian of the Year 2014 in business category. Chandrasekaran was presented with the "Best CEO for 2014" by Business Today for the second consecutive year. He has also received the Medal of the City of Amsterdam - Frans Banninck Coqc - in recognition of his endeavor to promote trade and economic relations between Amsterdam and India. He was awarded Qimpro Platinum Standard Award 2015 (Business) and Business Today’s Best CEO 2015 (IT & ITEs). Chandrasekaran was conferred with the honorary doctorate by JNTU, Hyderabad, India (2014). He has received Honorary Doctorate from Nyenrode Business Universiteit, Netherlands' top private business school (2013). Chandrasekaran has also been conferred honorary degrees by many Indian universities such as the Gitam University, Visakhapatnam, Andhra Pradesh (2013) KIIT University, Bhubaneswar, Odisha (2012); and the SRM Institute of Science and Technology, Chennai, Tamil Nadu (2010). In April 2017, India Today magazine ranked him #10th in India's 50 Most powerful people of 2017 list. On 12 August 2017, Chandrasekaran was conferred the degree of Doctor of Letters (Honoris Causa) by his alma mater National Institute of Technology, Tiruchirappalli. ^ a b "N Chandrasekaran takes over as TCS CEO". Business-standard.com. Retrieved 18 November 2010. ^ "N Chandrasekaran takes over as CEO of TCS". The Times Of India. 7 October 2009. ^ "Tata Sons chairman N Chandrasekaran may follow leadership style of JRD Tata". ^ "Marathon man: Tatas pick first non-Parsi and professional executive as group chairman". Reeba Zachariah. The Times of India. 13 January 2013. Retrieved 21 September 2017. ^ "'Wasn't academically brilliant, but would put mind and heart into duty', says Natarajan Chandrasekaran elder brother". Rajesh Chandramouli. The Times of India. 13 January 2017. Retrieved 30 May 2018. ^ "Sundowner with N Chandrasekaran". The Economic Times. 16 February 2008. Retrieved 4 October 2009. ^ "TCS News & Events: Press Release: Annual revenues cross trillion rupees in 2015-16". www.tcs.com. Retrieved 3 August 2016. ^ "N Chandrasekaran: 'Wasn't academically brilliant, but would put mind and heart into duty', says Natarajan Chandrasekaran elder brother". Timesofindia.indiatimes.com. Retrieved 13 January 2017. ^ "Meet N Chandrasekaran, the man from Namakkal appointed as Chairman of Tata Sons". The News Minute. Retrieved 13 January 2017. ^ "Search at Athlinks.com at Athlinks.com". www.athlinks.com. Retrieved 13 January 2017. ^ "Home". NYRR. Retrieved 13 January 2017. ^ "TCS chief N Chandrasekaran appointed to board of Reserve Bank". www.businesstoday.in. Retrieved 3 August 2016. ^ "2015 All-Asia Executive Team Pays Tribute to Trailblazers". www.institutionalinvestor.com. Retrieved 3 August 2016. ^ "List of winners of Indian of the Year 2014". News18.com. 17 March 2015. Retrieved 3 August 2016. ^ "India's Best CEOs 2014". www.businesstoday.in. Retrieved 3 August 2016.